Screenshot capture software is usually used by bloggers and Webmasters. They use captured Screenshots for illustrating posts with image guides. So many shareware and freeware screenshot capture software is available in the internet. Most poplar tools like Techsmith Snagit and Ashampoo snap 3 are available for 30 day trial download. However, if you don’t need advanced editing features, paying for a screenshot capture doesn’t worth as it can be done by pressing the print screen key. So here I am listing few good freeware screenshot capture software for Windows users. Techsmith Snagit screenshot capture software . The latest release of Snagit is version 9, which costs around $30. However, here I will provide a link to download snagit 7 full version absolutely free. Snagit 7, though an old version, it contains all tools for screen capture and editing. Go to this site. Wait for sometime before the flash animation loads. Select 13 from all listed numbers. Now click on the blue button. This will open a new window where you have to enter your email and a password (enter twice). Now the page will be redirected to another page where you will see a download link for Snagit 7 and serial number. Download Techsmith Snagit 7 here. ScreenHunter is just another freeware screenshot software for Windows. It has both free and PRO versions. Free version has some limitations, but can be used for basic screen capture and editing use. 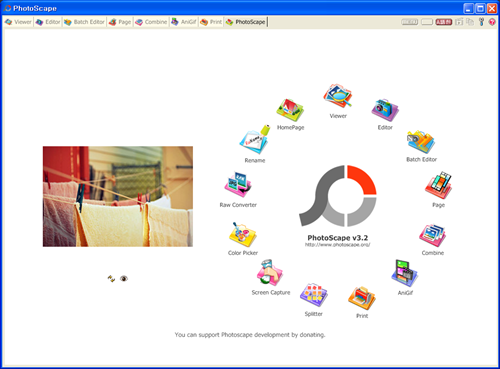 Photoscape is one of the best free screen capture software for Windows. It has tones of features that even not offered by paid screenshot software. It has a screenshot viewer, converter and image editor for enhancing images with effects and textual modifications . Download Photoscape screenshot software here. Ashampoo snap 3 is not a freeware screen capture software. But it has a 10 day trial version that you can upgrade up to 40 days for free. I am personally using this and its far better than Techsmith Snagit 9. Latest version has a video capture feature along with extensive image editing and converting tools. Download Ashampoo snap 3 here. I use another program, which is just cool. It’s called SnapaShot. It’s also free (though you can try and buy a Pro version), and there are some great moments about it: no installation, wonderful design for Vista and Win 7 (just 2 buttons), quick and clear.